Updated 11/10/15: Changed name from "2014" to "Second Generation" per iXsystems request. Charts screenshots were not updated. Updated features table. If you like to "do it yourself", you've probably considered building your own NAS using the FreeNAS open source software based on the FreeBSD operating system. If you'd prefer an off the shelf pre-built NAS, but still want to use FreeNAS, the FreeNAS Mini is iXsystems' product for the SOHO market. They also offer enterprise-level systems based on FreeNAS under the TrueNAS product line. Several years ago, Doug Reid covered iXsystem's FreeNAS Mini and included background on how FreeNAS came to be. This review covers the Second Generation version (Gen 2) of the FreeNAS Mini, which features new case, processor and motherboard and an updated operating system. In addition to our normal suite of tests, we also tested the FreeNAS Mini with an optional 10GbE connection. For comparison throughout the review I'll be using the QNAP TVS-471-i3-4G High-performance Turbo NAS and QNAP TVS-463 Golden Cloud Turbo. Both of these were also reviewed using our latest NAS benchmark tests and were also tested with 10 GbE connections. The FreeNAS Mini Gen 2 is built in an off-the-shelf Ablecom CS-M50 case. The callouts below show the front panel of the FreeNAS Mini. The tool-less drive trays are hot swappable, and the drive bay cover, shown in the product shot at the top of the review, is lockable. The photo below shows the rear panel of our review unit. As you can see, the power supply is built in and takes a standard AC power cord. For those of you who still remember serial ports, the FreeNAS Mini has a serial port (default 9600) as well as an IPMI (Intelligent Platform Management Interface) port for out-of-band management. Note that the optional 10GbE dual port card has been installed on the right. The callouts below, taken from the FreeNAS Quick Start guide, identify the ports above. Both the IPMI and the Gigabit Ethernet Ports have two LED indicators. One shows Activity/Link, and the other shows Speed. Note that there are slightly different indications for the IPMI port and the Gigabit LAN ports. The FreeNAS mini is based on the ASRock Intel Avoton C2750 ITX Motherboard and CPU combo. DIYers can find the complete board (without memory) on Amazon for $390. The board features one PCI-Express 3.0 slot, eight SATA3 ports and four SATA2 ports. Only 3 USB 2.0 ports are supported. As shown in the rear callouts above, there are also 2 RJ45 Gigabit LAN and one dedicated IPMI dedicated LAN PORT. The image below shows the main board with a large heat sink installed. 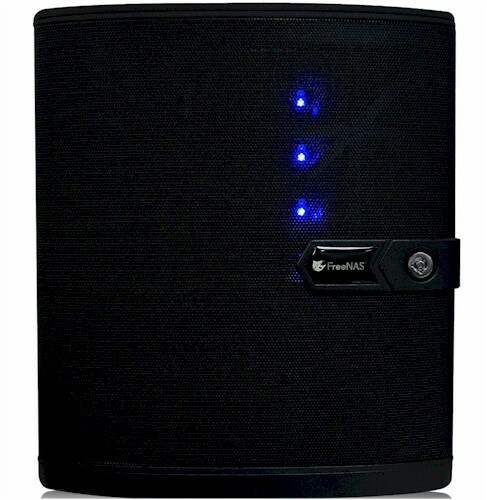 The image below shows the left side view of the FreeNAS Mini. That's the Intel X540-T2 dual-port 10GbE board with the black heatsink. Here's the right side view, showing the Flex ATX 250W power supply. The top view, below, shows this single large fan used to cool the system. There's also a spot and power cables for two SSD cache drives. The QNAP TVS-471 proved to be difficult to disassemble, so we weren't able to extract individual component part numbers as we normally do. However, I've taken what information that we were able to determine for key components and put it into the component summary comparison table below. Note the FreeNAS uses ECC RAM. Power consumption with four SmallNetBuilder-provided WD Red 3TB (WD30EFRX) drives was 47W (active). There is no power save mode. RAID 5 and RAID 10 rebuild time was immediate. Fan and drive noise was rated as medium. Often, I forget the NAS Finder is a good, quick way to compare several products side-by-side. I created a features comparison chart for the FreeNAS mini as well as the two comparison QNAP NASes. The missing green dots make it easy to compare the three NASes. The complete table is fairly large, so you can look at the entire comparison here. There have been quite a few changes in the FreeNAS mini since the original review. We asked iXsystems for a summary of the major hardware and software changes, which are shown below. Note our original review was for FreeNAS version 8.3 - the current review is FreeNAS version 9.3. - ECC RAM. Critically important for FreeNAS/ZFS, the Mini comes standard with 16 GB and can be upgraded to 32 GB. - Central plugin repository with in-place updates to easily manage plugins. - Intelligent compression that improves performance. - Better support for SSDs used for capacity. - Boot devices are mirrored and support multiple boot environments. - Updates can be automatically downloaded and applied. - Support for the Internet of Things and mobile devices with WebDAV support. - VAAI/Block and snapshot integration with vSphere snaps. - Microsoft ODX and cluster shared volumes support. - Boot images allow you to roll back your system to what it looked like before the update. - File Sharing supports NFS v4. - Directory support adds Apple Open Directory, enhanced with Kerberos Realms and Keytab support. - The administrative GUI has been improved. - Support for certificates in various services that support SSL or TLS. One of the major features of FreeNAS is its use of the ZFS (Zettabyte File System). Again, I refer you to Doug's original description of ZFS. As Doug pointed out, "to achieve high degrees of data integrity, ZFS is memory intensive. FreeNAS recommends 1GB of RAM for every 1TB of storage. This is why the Mini Plus has an unusually high amount of memory for a NAS - 16GB." iXsystems provides history about FreeNAS as well as a white paper about Open ZFS. Both make for worthwhile reading. One of the new features of the FreeNAS 9.X operating system is an upgraded UI. The screenshot below shows the UI from version 8.3. Note the limited number of tabs across the top and corresponding menu selections in the left column. The screenshot below shows the landing page (System information) for the current FreeNAS-9.3 OS. Across the top of the screen and arranged vertically in the left column are the major top level menus. If you click on one of the "+" icons next to a menu in the left column, a submenu will open. Note how the submenus under the System tab correspond to the submenus under System in the left column. If you click on the Guide tab or menu, a copy of the FreeNAS user guide will appear as shown below. You can also download the FreeNAS Version 9.3 user guide. The Gallery below contains some interesting screenshots from some of the other FreeNAS Version 9.3 menus. I filtered the NAS charts for the latest testing method (black bars) and RAID5. The composite image below shows the benchmark results for File Copy Write Performance (left) and File Copy Read Performance (right). For many NASes, the performance is limited not by the ability of the NAS to handle a heavy load, but rather the limit of Gigabit Ethernet and a single client. Many of the test results for File Copy Read and Write were between 109 and 110 MB/s - about the maximum you can achieve with Gigabit Ethernet. However, for FreeNAS Mini Gen 2 didn't come close to maxing out the Gigabit connection on either the Write or Read File Copy tests. It was 16% slower for write operations and 11 % slower on read operations than the chart-topping 110.1 MB/s. I've created two composite images that show benchmark summaries for the FreeNAS Mini, QNAP TVS-471-i3-4G and QNAP TVS-463. The first image shows the test results using a Gigabit Ethernet connection. The second chart shows test results using a 10GbE connection. Looking at these results, you'll start to see a trend. For the FreeNAS Mini, you'll tend to see consistently lower write performance than read performance for corresponding tests of the same RAID level. For example for both RAID 5 and RAID 10, File Copy Write was about 15% slower than File Copy Read and RAID0 File copy Write for the FreeNAS mini was about 16% slower than either of the QNAP NASes that topped out at ~110MB/s. There aren't any built-in backup utilities so backup tests weren't run. The FreeNAS Mini turned in the best performance of the three for iSCSI Read, but the slowest iSCSI Write results. Removing the limitations of Gigabit Ethernet by using a 10 Gigabit Ethernet LAN connection, you can start to draw some conclusions about performance that are otherwise masked. The image below shows benchmark summaries for the same three products as above. Several results pop out in the 10 GbE tests. First, for all RAID levels, File Copy Read on the FreeNAS Mini was almost 4 times as fast as File Copy Writes. And for all RAID levels, the FreeNAS File Copy Read performance also "blew away" the results for both QNAP NASes on corresponding tests. However, the File Copy write performance for both QNAP NASes was significantly better than the FreeNAS mini - in some cases by a factor of 3. The FreeNAS Mini also had excellent File Copy Read results for RAID 5 and RAID 10 NASPT File copy from NAS as well as RAID5 and RAID 10 NASPT 4x HD Playback. Following the trend we saw on the Gigabit tests, the FreeNAS Mini had the fastest iSCSI Read performance, but slowest iSCSI Write. As we have noted in the in several reviews, we don't include 10GbE results in the NAS Rankings because not all products support it. And because we don't have many 10GbE products in the Charts, we don't have a separate Ranker for them. With the addition of the FreeNAS Mini, we now have four 4-bay NASes tested with a 10GbE connection. I've created a chart that shows File Copy Write and File Copy Read results for RAID 0, 5, and 10. The results are amazingly consistent. For File Copy Write, the QNAP TVS-471-i3-4G had the fastest throughput for all three RAID levels, and the iXsystems FreeNAS Mini Gen 2 had the slowest by a significant margin. For RAID 0, the TVS-471-i3-4G was 3.5 times faster than the FreeNAS. The QNAP TV-463 and the TS-470 Pro held second and third place, respectively, for all RAID levels. For File copy Read, the results were completely different. The iXsystems FreeNAS outperformed all other three NASes - by a lot. It was over 200 MB/s faster (or more) than the second rated NAS for each RAID level. Just looking at the chart, you can count that there are 12 NASes that have a better Total NAS ranking and are cheaper than the #15 ranked FreeNAS Mini Gen 2. And, priced only $4 more than the FreeNAS Mini, is the #1 ranked RAID 5 NAS, the ASUSTOR AS7004T. The composite chart below shows the ranker performance summary for the FreeNAS Mini Gen 2, QNAP TVS-471-i34G and QNAP TVS-463. As you can see, the FreeNAS Mini was up against some very tough competition with the QNAP TVS-471-i3-4G ranking #1 for Write Benchmarks and #4 for Read Benchmarks. Similarly, the QNAP TVS-463 ranked #2 for Write Benchmarks and #1 for Read Benchmarks. Low NASPT Directory Copy Write scores pulled down the entire write category to #17. Good performance on the tests in the video category helped the FreeNAS Mini Gen 2 edge the other two NASes in the category. At $995, the FreeNAS Mini Gen 2 is a very expensive four bay NAS if you intend to use it with a single Gigabit connection. The Mini Gen 2 didn't exhibit chart-topping write or read performance in our Gigabit Ethernet tests and there are quite a few other four bay NASes that are less expensive but have better Total NAS scores. Only in the 10GbE tests did we see outstanding File Copy Read performance. But 10GbE File Copy Write performance lagged far behind the comparison QNAPs. Keep in mind that adding a dual-port 10GbE card adds significant cost. The dual-port card is a $290 upgrade for the Mini and $600 (!) for the QNAPs. The FreeNAS mini comes with only a bare bones installation of apps. While you can install plug-ins, installation isn't as straightforward as installing apps on other NASes from manufacturers such as Synology, QNAP, ASUSTOR and NETGEAR. Missing, for example, is a pre-installed DLNA server, an iTunes server and backup software. Other NASes also offer a range of iOS and Android apps that provide remote access, media streaming and cloud synchronization capabilities. Those features are also missing on the FreeNAS Mini Gen 2. But then again, home users are not the target FreeNAS audience. FreeNAS, with its ZFS file system, focuses on data integrity, which is more a must-have for the corporate crowd. Aside from Infortrend, which we haven't heard from since 2012, there aren't a lot of other ZFS-based NASes out there. But NETGEAR's ReadyNASes can go toe-to-toe with ZFS for data integrity using the BTRFS file system. Unfortunately, if we're comparing 10GbE capable ReadyNASes, there is only the six-bay RN716x, which will run you at least $2700 for the diskless version. With that perspective, the Mini Gen 2, at just shy of $1300, is a relative bargain. If you want a ZFS-based NAS, the FreeNAS Mini Gen 2 takes the hassle out of purchasing individual components, assembling them and installing FreeNAS. And it's a step up in performance at the same price as the original FreeNAS Mini, with the added plus of optional 10GbE. But for most SOHO consumers, there are quite a few NASes that offer significantly more features, have better performance, are easier to use and are cheaper than the FreeNAS Mini Gen 2.